On the fifteenth of April, there will be an international climate protest organised by Extinction Rebellion. 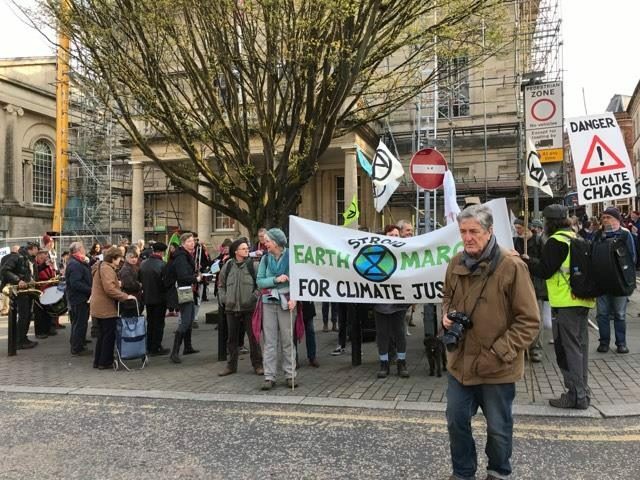 Today members of the Stroud Extinction Rebellion group set off on their march to London to highlight the crisis we face, no not the Brexit crisis… The ecological crisis that is leading to huge swathes of life on earth to extinction if changes are not made swiftly. The need to act is urgent as many climate campaigners say we are facing the sixth mass extinction on our planet now. The Living Planet report documented a 60% decline of vertebrate animals since 1970. Coral reefs vital to the health of oceans are dying and we are increasingly poisoning the air we breathe. Climate breakdown is causing more extreme weather, killing thousands in heatwaves, fires, floods and hurricanes etc. Popular scientific opinion offers hope that we have time to stop this climate catastrophe but Governments and corporations need to act now. That is why Extinction Rebellion are rebelling. Labour MP, David Drew attended in support of the March from Stroud to London and our correspondent interviewed him.